As an automotive writer, I occasionally get the chance to review cool cars. An Alfa Romeo 4C. A new Toyota Land Cruiser. A Porsche 911 Turbo Cabriolet. Well, last week I reviewed a 13-year-old Kia that screeches upon startup like a middle school fire alarm. It was glorious. In fact, I think this is the best car I’ve ever reviewed, for one simple reason: I just didn’t care about it. More on that in a minute. But first, let me introduce you to this Kia. 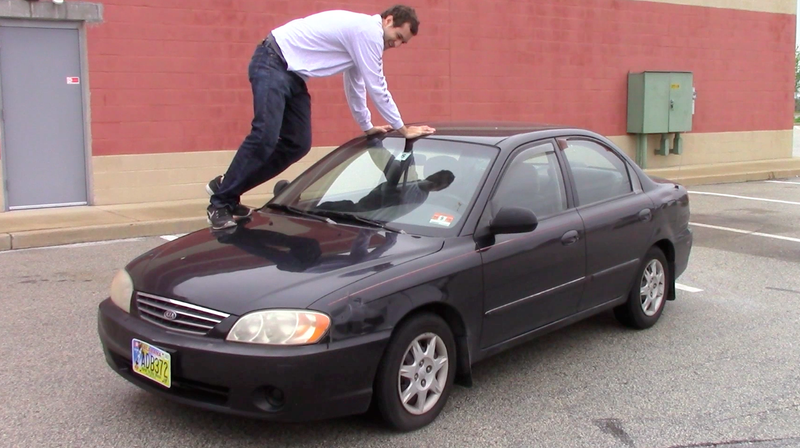 The Kia I reviewed is a 2003 Spectra that’s owned by my cameraman, Filippo, who has helped me film many of my videos since I moved to Philadelphia. Filippo purchased it for one dollar from a co-worker who was moving across the country. According to Edmunds.com, Filippo got ripped off. I say this because Filippo visited the Edmunds.com trade-in value calculator about six months ago, and he put in all the car’s details, and the site told him the car was worth -$39. Not thirty-nine dollars. Negative thirty-nine dollars. In other words: according to Edmunds, if Filippo wanted to trade in his Spectra on a newer vehicle, he would have to pay the dealer thirty-nine dollars just to take it off his hands. So what makes a car worth negative thirty-nine dollars? Well, for one thing, there’s the lack of air conditioning. It’s not that it’s broken; it’s that it never came with it in the first place. Also, the plastic surrounding the passenger seat belt buckle is gone, the passenger door handle is falling off, the parking brake doesn’t work, the shift boot is missing, and the headlights are about as transparent as a notecard. And then there’s that noise. It’s there whenever you start the car, reminding you that you do not live a life that normal people live. Rather, you live a worse life; a life where your car sometimes does an impression of a howler monkey. And that doesn’t even begin to describe the car’s cosmetic condition, which is, I would say, quite bad. There are dents in front, on the sides, and in back. There are scrapes, bent panels, and there’s one area that looks like it was repaired by a person whose sole prior automotive experience came from racing Micro Machines in his parents’ basement. It might appear to a casual observer like it was once washed with rocks. And yet, getting behind the wheel of this thing is a remarkably freeing experience. Consider, for example, parking. Only car enthusiasts will understand how I park my Aston Martin. What I do is start at the front of the lot, and then work my way back, slowly rejecting every single parking space along the way. I only stop when I find an end space surrounded by one of those little tree islands about a quarter-mile away from the store I’m trying to visit. I say that car enthusiasts will understand what I mean because this space is usually already occupied by a Mazda RX-8. You know where you park the Kia? Wherever you want. There’s a tight spot right in front next to a scratched up minivan and a Chevy Lumina with a blue interior and a bumper sticker that says “GOD GAVE ME 8 BEAUTIFUL GRANDCHILDREN”? Park there. It doesn’t matter. There’s one point in the video where I slam a shopping cart into the Kia. Filippo—the vehicle’s owner, mind you—scolded me for not pushing the cart hard enough, so we shot the scene a second time. Needless to say, we have not yet filmed a scene where I push a shopping cart into the Aston. Then there’s driving. In a sports car, you think about every bump, and every scrape, and every road, because you’re worried it might damage your beloved front spoiler, or your bumper, or your wheels. In the Spectra, you don’t think about any of that crap. It gives you a lot more time to focus on other crucial driving experiences, such as texting. The Spectra has other benefits, too. Maintenance and repairs, for example, can be done as cheaply as possible without affecting the car’s value or its performance. Want to use a zip-tie? Some duct tape? A literal Band-Aid? Go for it! Meanwhile, the Aston just returned from an annual service that cost $1,420. According to Edmunds, the Spectra wouldn’t be worth $1,420 even if the trunk was filled with $1,450 in cash. And so, there’s something truly wonderful about driving a beat-up 2003 Kia Spectra, or any other car like it. Sure, you don’t get the acceleration, or the styling, or the sound of a sports car, but you get something else: an entire driving experience without a single worry. Your passengers, however, may fear an imminent attack from a howler monkey.